When India’s high-profile politicians head into town, its difficult to ignore their presence. I was in Cuddalore in Tamil Nadu last week to photograph the lives of those affected by the 2004 Asian tsunami. As I drove into town, I noticed an abundance of Indian Tricolours lining the road. These soon gave way to huge rosettes also in the green, white and saffron of India’s national flag. Further on into Cuddalore and large hoardings began to appear bearing the likeness of political figures, many of whom I recognised as the dominant players in India’s ruling Congress Party. At the town’s main junction a couple of palatial arches had been erected, featuring yet more political portraits, this time adorned with tinsel. Most prominent among the faces bearing down on Cuddalore’s citizens was P. Chidambaram, India’s Home Minister. There was Chidambaram dressed in a Western business suit reclining in a comfortable-looking leather armchair, Chidambaram in sunglasses, arms folded and looking purposefully towards the horizon and a full length Chidambaram dressed in the south Indian veshti, striding purposefully toward the viewer. I’ve no idea what the Anglified, Harvard educated Home Minister himself made of it all. Perhaps he’d have considered the display rather vulgar. Or maybe it roused a fond nostalgia for the days of his royal ancestry. 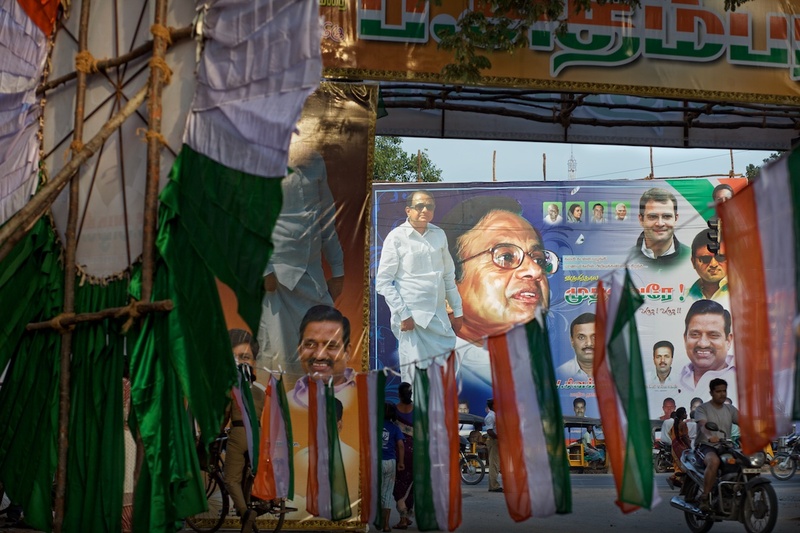 Every one of Cuddalore’s hoardings that featured Chidambaram presented an array other political luminaries who’s size and position within the display was a definite indicator of their status. Local Congress party workers were in there, consigned to the bottom-most fringes; acknowledged but also rather shunned. A portrait of Cuddalore Member of Parliament K.S. Alagiri, distinctly smaller than Chidambaram but significantly larger than anyone else, kept the Home Minister company. I spotted Nehru’s face a couple of times but was surprised not to notice Prime Minister Manmohan Singh’s portrait more often. Most reassuring was the ubiquitous presence of Sonia Gandhi, hovering deity-like above all else; no doubt there to keep a comforting eye on proceedings. Chidambaram was in Cuddalore to launch a student loans scheme intended to encourage poor families to send their children into further education. I’m entirely supportive of such initiatives but I’m certain I wasn’t the only one in Cuddalore last week who felt that the well-being of students was a rather secondary concern to those elected officials eager to exploit the situation for a bit of self-promotion. Of course we have our own more subtle – though no less cynical – displays of power and patronage in the West. Perhaps its only the coarse honesty of India’s political class which makes their arrogance and ambition easier to identify.